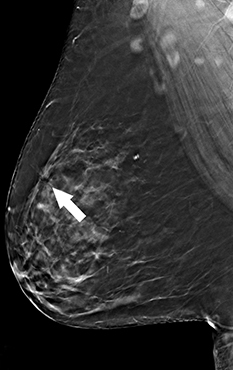 Stereotactic vacuum-assisted biopsy (S-VAB) has long been considered the preferred method to sample microcalcifications and sonographically occult masses in the breast, as well as a better alternative to traditional surgical excision.1 With increased utilization of digital breast tomosynthesis (DBT), DBT-guided vacuum-assisted biopsy (DBT-VAB) is now essential to biopsy mammographic abnormalities not well visualized on conventional full-field digital mammography (FFDM). Stereotactic vacuum-assisted biopsies are often performed with the patient prone, although add-on upright units are available for stereotactic biopsy. Prone S-VABs are performed with the patient lying on the biopsy table with the breast inserted into an opening in the table and compressed between the image receptor and compression plate. The compression plate contains the biopsy window, typically 5 x 5 cm in size. Initial scout images are performed with the X-ray tube perpendicular to the image receptor (0o position). After confirmation of the target within the biopsy window, a pair of images is obtained at +15o and -15o positions (stereo pair) to determine the location of the target in a Cartesian coordinate system (X,Y,Z). Alternatively, a polar coordinate system can be used for targeting, with the needle angled slightly upwards as opposed to perpendicular in the Cartesian coordinate system. This may allow for easier access to more posterior lesions.6 A vacuum-assisted biopsy device is then advanced to the calculated coordinates. A stereo pair of images may be taken prior to deploying the needle (Pre-Fire) and/or following the needle deployment (Post-Fire) to confirm appropriate needle location. Vacuum-assisted core samples are then obtained. Meanwhile, DBT-VABs are typically performed utilizing an add-on unit to a tomosynthesis-capable mammography machine with the patient in an upright position, although newer technologies are now available for prone DBT-biopsy. For upright DBT-VAB, the patient is usually positioned in a sitting or lateral decubitus position with the breast compressed between the image receptor and compression plate. The compression paddle is often transparent and comprises a larger biopsy window compared to those typically used with prone or upright S-VAB. The initial localizing scout image is obtained using DBT, which can then also be used to calculate the target location coordinates. 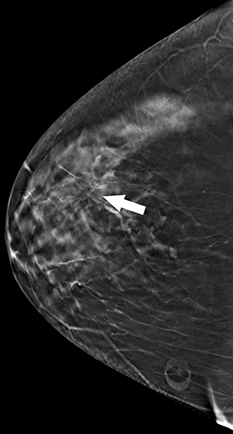 Once the biopsy device is advanced to the target, DBT images may be obtained prior to and following needle deployment to confirm needle location. Vacuum-assisted core samples are then obtained. Vacuum-assisted biopsy with patients in the prone position has a known limitation of being unable to target lesions that are far posterior in depth or close to the axilla due to limited positioning.7 This limitation is typically circumvented by placing both the ipsilateral arm and the breast of interest through the table opening (arm through the hole technique) in order to access more posterior tissue.8 Patient factors such as mobility and weight also may limit use of the prone stereotactic table. In addition, the prone table system is an expensive, and perhaps less cost-effective, unit that only has the ability to perform stereotactic biopsies and cannot be used for routine mammographic imaging. As early studies are demonstrating the advantages of DBT over FFDM, including increased invasive cancer detection rates particularly with abnormalities identified only on DBT, DBT-VAB is being used more frequently. DBT-VAB has shown many advantages and few disadvantages when compared to S-VAB and may eventually replace S-VAB in terms of sampling mammographic abnormalities identified on both DBT and FFDM. Additionally, with the advent of prone DBT-VAB, some of the disadvantages of upright tables may be avoided with the use of prone tables while maintaining the advantages of DBT biopsy. Schrading S, Distelmaier M, Dirrichs T, et al. Digital breast tomosynthesis-guided vacuum-assisted breast biopsy: initial experiences and comparison with prone stereotactic vacuum-assisted biopsy. Radiology. 2015;274(3):654–662. Sharpe RE, Venkataraman S, Phillips J, et al. Increased cancer detection rate and variations in the recall rate resulting from implementation of 3D digital breast tomosynthesis into a population-based screening program. Radiology. 2016; 278(3):698–706. Carbonaro LA, Di Leo G, Clauser P, et al. 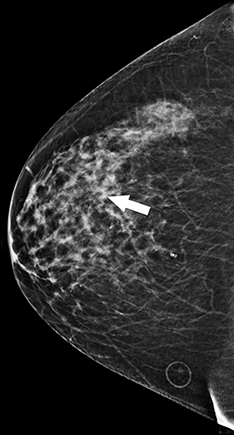 Impact on the recall rate of digital breast tomosynthesis as an adjunct to digital mammography in the screening setting. A double reading experience and review of the literature. Eur J Radiol. 2016; 85(4):808-814. Kopans, DB. Digital breast tomosynthesis from concept to clinical care. AJR Am J Roentgenol. 2014; 202(2):299–308. Durand MA, Wang S, Hooley RJ, et al. Tomosynthesis-detected architectural distortion management algorithm with radiologic-pathologic correlation. RadioGraphics. 2016; 36(2):311–321. Kopans, DB. Breast Imaging. 3rd ed. Philadelphia: Lippincott, Williams & Wilkins; 2006. Jung YJ, Bae JY, Seo H, et al. 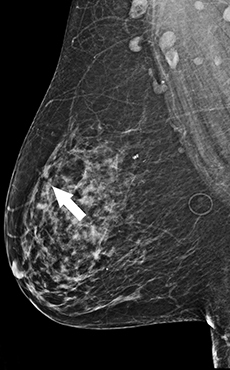 Lateral decubitus positioning stereotactic vacuum assisted breast biopsy with true lateral mammography. J Breast Cancer. 2011; 14(1):64-68. Soo MS, Walsh R, Patton J. Prone table stereotactic breast biopsy: facilitating biopsy of posterior lesions using the arm-through-the-hole technique. AJR Am J Roentgenol. 1998; 171(3):615-617. Paulis LE, Lobbes MB, Lalji UC, et al. 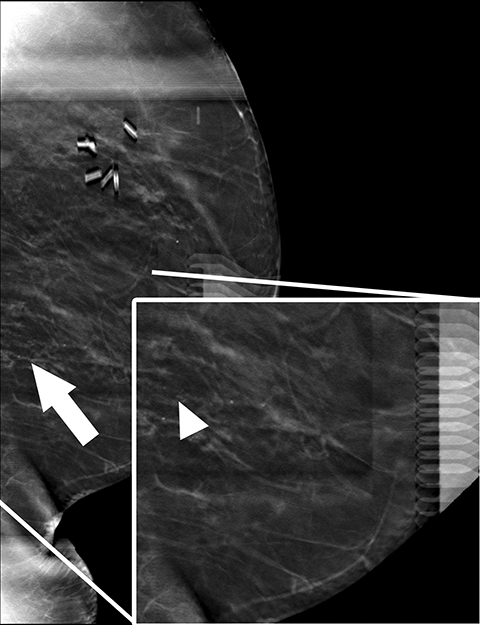 Radiation exposure of digital breast tomosynthesis using an antiscatter grid compared with full-field digital mammography. Invest. Radiol. 2015;50(10):679-685. Sumkin, JH (2016, April). Tomosynthesis (DBT) directed biopsy. Presented at the meeting of the Society of Breast Imaging, Austin, TX. Jonna AR, Sam KQ, Huynh PT. Stereotactic breast biopsies: An update in the era of digital tomosynthesis. Appl Radiol. 2018;47(9):17-20. Dr. Jonna is a Radiologist in Breast Imaging, Department of Radiology, at Houston Methodist Hospital, Houston, TX; Dr. Sam is a Radiologist at Providence Hospital of North Houston, Houston, TX; and Dr. Huynh is a Radiologist in Breast Imaging, Department of Radiology, at Baylor St. Luke’s Medical Center, Houston, TX. The authors have no conflicts of interest to declare.